The situation can still be salvaged if Dilliwalas stick to the WHO norms of using 135 litres per capita per day. The report further said that in 2000, the water level in 27 per cent of Delhi's landscape stood at 0-5 metres below the ground, but in just 17 years, the area has shrunk to 11 per cent. In 2000, water was available 40 metres below ground level (bgl) but in 2017, for 15 per cent of Delhi (around 222 sq km), it depleted to 40-80 metres bgl. To put it simply, over the last two decades, there has been an increase in the number of spots where one needs to dig deeper to reach the groundwater. 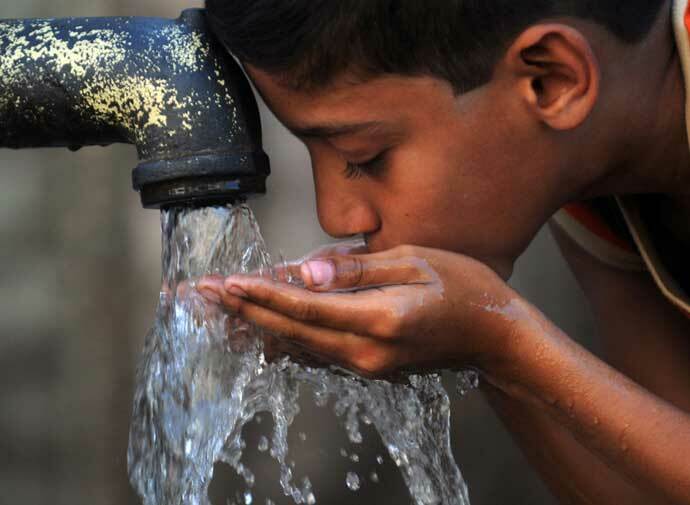 Situated at the tail-end of the water distribution system, and far from the water treatment plants, for decades now, many areas of southeast, south and southwest Delhi have been facing water problems. Instead of adopting remedial measures, the Delhi Jal Board (DJB) has, time and again, indirectly encouraged the water tanker mafia by not acting against them. This water tanker mafia merrily go about digging illegal borewells, emptying Delhi's precious aquifers. But the most serious revelation made by the CGWB report submitted to the top court is that New Delhi is now counted among "overexploited" zones. It is the same area that witnessed acute water retention till the 1970s, following which New Delhi Municipal Council (NDMC) deployed sumps to pump out the excess sub-surface water. The crisis began as commercial high-rises came up near the Connaught Place area in the '70s. More than two decades later, in the 2000s, the Delhi Metro lines were laid and today, the Supreme Court extension chambers and a convention centre at Pragati Maidan are being constructed - all adding to the rising demand for water in New Delhi. Such large-scale construction requires de-watering, which leads to continuous depletion of the groundwater level. As a correspondent for Hindustan Times, I had reported on CGWB statistics showing how the water in Agrasen Ki Baoli - a heritage stepwell near Connaught Place - had begun to dry faster in the post-monsoon months soon after the underground Rajiv Chowk-Barakhamba-Mandi House Metro was constructed and became operational. By 2010, the baoli went completely dry. It is indeed a sad situation for a city that, at one time, did not have to depend on the Yamuna and managed to conserve and store rainwater with such beautiful stepwells. To date, even though there are well laid-out procedures on paper, there is no action against the defaulters on the ground. Neither against the government agencies that cause such a situation nor individuals or mafia who take advantage of the absence of government control. What is more, our squabbling agencies point fingers at one another, giving an opportunity to the culprits to go scot free. The trouble starts with the capital's nodal agency for water, the Delhi Jal Board (DJB). While it preaches rainwater harvesting, much like the Delhi government it hardly walks the talk. Few government buildings have rainwater harvesting systems but most of them are not functional. So, instead of harvesting much of the still abundant 650-700mm rainfall that Delhi records annually, the DJB depends on neighbouring states to quench the capital's thirst. But since the 750-odd million gallons per day (MGD) it gets is highly inadequate, it extracts almost 100MGD of water to meet the gap. Yet, it fails. Owing to the insufficient supply, more and more residents turn to groundwater. No wonder the dark zones keep increasing by the year. South and southwest Delhi are contagious areas, as is neighbouring Gurgaon where the water levels have been depleting at an alarming rate. Large-scale construction, water-guzzling malls and extraction by residents go unchecked in a city that is perennially in the making. This has had a drastic impact on Delhi as groundwater aquifers do not know political boundaries - the same is the case for East Delhi that has contagious aquifers owing to neighbouring Noida and Ghaziabad. What is tragic is various agencies in Delhi do not seem to agree over who is responsible for acting against illegal borewells. There is a district-level committee that is supposed to give permissions for new borewells. Apart from other departments, the committee has a revenue department official and a representative from the DJB. The DJB claims that it is not its job to act against illegal diggers. On the other hand, the revenue officials claim that for them to take action, the DJB must first point out which are illegal borewells. This buck passing has meant that groundwater extraction continues unabated. A personal anecdote to explain this lack of coordination: in 2013, I had written in one of my reports that even though groundwater extraction is banned, about 4.5 lakh tube wells/borewells continue to draw water with impunity in Delhi. During a hearing at the National Green Tribunal (NGT) the same day, the court asked the agencies why there were so many illegal structures despite the ban. The DJB, the revenue department, the environment department of Delhi government and even the CGWB officials all feigned ignorance about the staggering number of borewells. Needless to say the officials got an earful from the court which asked them to submit a report in the matter in 10 days. My report was based on the Census 2011 data, drawn from one of the government's own arms. But its other arms were unaware of that data and claimed they had no such information about the borewells. Rightly termed the "reserve bank" for water, groundwater is the resource that will stand us in good stead when Delhi's neighbours refuse to share the Yamuna's waters. As mentioned above, spread over 1,483sqkm, Delhi still receives an annual rainfall of 650-750 mm in the months of July-September. Just 100 years ago, the city had about 1,200 big and small water bodies which stored rainwater for direct use and also recharged the groundwater table. Indian government planners blundered worse than the Britishers who had designed New Delhi. In the pre-Independence era, there were hundreds of dug wells across Delhi apart from the surface water bodies. This proved to be a wonderful decentralised system of water supply before the Britishers introduced centralised piped water supply. Post-Independence, neither the government of Delhi nor the Centre bothered to revive the dug wells. What is more, to date, citizens, the industry and the water tanker mafia continue to dig deep with scant regard for law. The situation can still be salvaged if Delhi and Dilliwalas learn to appreciate the value of water and stick to the WHO norms of using 135 litres per capita per day (lpcd). Currently, most of Delhi's plush colonies get about 220lpcd or more of water while the Lutyens' zone bungalows get about 500lpcd. Then there are fringe zones such as Devali and Mehrauli that do not get water on a daily basis, let alone the promised 200 litres. The larger question is: why can't Delhi go for equitable distribution? Despite simple, effective measures, there is little progress. We must revive surface water bodies and small and big lakes that can store rainwater and recharge the depleting groundwater, plant more trees so that there is less desertification and recycle and re-use the grey water for which extensive studies have been carried out. It is high time we treat the existing sewage and bring down the BoD that will enable the Yamuna to flow better. Many a time, the authorities play foul. For instance, "Natural Heritage First" volunteers have been in the process of reviving a water body in Dwarka but the Delhi Development Authority (DDA) officials have spectacularly thwarted the community's attempt to own and restore it. The least that the authorities can do is take stringent action against the water tanker mafia and illegal borewells across the city. South Delhi is home to the ruins of the Tughlaqabad Fort built in the 14th century. There goes a tale surrounding this site that can be a wonderful metaphor for today's situation. It is believed that Delhi's celebrated sufi mystic Nizamuddin Auliya wanted to have a baoli (stepwell) built at the place where he stayed at the time. Ghuiyasuddin Tughlaq, the then ruler of Delhi, was having his fort built in the same area. As he wanted to see the fort erected faster, he ordered that all masons in the city be employed for the task and forbade them to work at the baoli. But out of sheer reverence for the mystic, people worked through the night for the stepwell, in the shadow of oil lamps. So, the tyrant ruler banned the sale of oil. The mystic being a mystic used the baoli water to light the lamps, and shine they did. Angered by this, Tughlaq then banned the men from working at night. It was then that the mystic cursed: "Ya rahe ujad, ya base Gujjar." (It will either be abandoned or be inhabited by pastoral nomads). As luck would have it, Ghiyasuddin Tughlaq died within two years of the fort's completion and the fort has battled the vagaries of nature ever since. No royal has ever lived there. It is the community that needs to take charge and conserve Delhi's precious groundwater. There is no point in relying on the king - the government of the day - be it at the Centre or in Delhi to take action. Else, let's be ready to meet Tughlaqabad Fort's fate. The author is an independent journalist based in Delhi. She writes on environmental, developmental and social issues.